We hear a lot about how the negative tone in which political debate is conducted has contributed to a declining willingness amongst people to get involved. Whether that’s true or not, the current political debate on the Scottish Independence Referendum due to take place in September 2014 claims to offer an antidote to those who are drained by relentless negativity. Politicians are currently falling over themselves to prove that they are approaching the questions surrounding Scottish independence with a positive outlook. Both those for and against independence insist that the only way to win their case is to demonstrate the positive aspects of their claims, rather than focus on the flaws in their opponents’ arguments. This week’s evidence session held by the House of Commons Scottish Affairs Committee provides a nice insight into this. These snapshots of committee evidence are emblematic of the broader thrust of the referendum debate. The participants on both sides, but particularly on the unionist-side, have been extremely eager not ‘go negative’ for fear this will fuel their opponent’s cause. Naturally, these assurances from participants about remaining positive are part of a bigger rhetorical toolkit and, as we see in the extracts above, often come hand-in-hand with critiques of opposing claims. Those in favour of preserving the UK are fearful of appearing to make the patronizing claim that Scotland ‘could not go it alone’. Those in favour of independence are reluctant to paint too much of an us-and-them portrait of the United Kingdom given the sizeable English population that resides in Scotland. This week’s grueling debacle over the appalling threat by the owners of the Grangemouth petrochemical plant to close the facility if workers don’t accept seriously compromised pay and conditions may yet shift the emphasis of debate away from the so-called positives of union and independence, into more meaningful terrain about how Scottish political actors actually deal with serious political and economic problems. Dr Pia Riggirozzi (PAIR) is to start a new funded research project funded by ESRC-DFID Poverty Alleviation 2013. Titled ‘Poverty reduction and regional integration: a comparative analysis of SADC and UNASUR health policies’, the project examines the scope for enhancing Southern multilateral regional organisations’ contributions to poverty reduction through regional health policy, and it is guided by the following question: what regional institutional practices and methods of regional policy formation are conducive to the emergence of embedded pro-poor health strategies, and what can national, regional and international actors do to promote such practices and methods? Dr Riggirozzi will examine and compare the Southern African Development Community (SADC) and the Union of South American Nations (UNASUR) institutional mechanisms and policy development methods and practices. The project investigates how regional and national levels of authority are co-produce and are connected by these; and develops monitoring instruments (Toolkits) to assess regional policy change and success in relation to impoverished populations’ access to health care and medicines in Zambia and Swaziland in Southern Africa, and Bolivia and Paraguay in South America. The central hypotheses underpinning this question are that there are unexplored synergies between regional institutions and poverty reduction; that regional integration processes have potentially significant impacts on health equity and access to health care, and that there is scope for effective policy intervention. There is growing recognition that regional integration ambitions and initiatives extend beyond commercial trade and investment to embrace health and welfare policy, but little is known about whether and how regional commitments on poverty are being implemented in these domains and what kinds of regional policy development processes are conducive to the emergence of embedded pro-poor approaches and effects in regional and national spheres. We investigate this by undertaking a comparative analysis of SADC and UNASUR’s regional agendas and ambitions, regional programmes of action and regional processes of policy development in relation to access to health care, undertaking in-depth fieldwork in low income countries of Zambia, Swaziland, Bolivia and Paraguay confronted with serious socio-economic challenges, low levels of service delivery and immense public health challenges. We undertake data collection and data analysis using mixed methods, comparative and participatory approaches and methodologies. In doing so, the project seeks to contribute new analytical and evidence to debates about the role and effectiveness of regional formations in health-poverty reduction programmes and what actors such as international donors, civil society organisations, governments and business and philanthropic organisations can do to support pro-poor regional health policies. The project brings together a cross-disciplinary team of researchers in renowned institutions in Southern Africa (South African Institute of International Affairs, South Africa), South America (FLACSO, Argentina), United Nations University /Institute for Comparative Regional Integration Studies (Belgium), and the Open University and the University of Southampton in the UK. Dissemination of research outputs will enhance the scope for improvements in regional health policy for poverty reduction and policy options, while contributing to academic debates about global/ regional (health) diplomacy. Matt Lucas: With so many young people completely disconnecting from politics, it has become very difficult to find ways to make them engage. For this reason the topics chosen, debates and discussions, in order to re-engage young people, need to be interesting and intriguing, for example: “Should we invade Syria?” Once they start thinking about these kinds of questions themselves and what would happen as a result, then politics becomes fascinating. And hopefully these topics would make it into everyday conversation. Ashley King: The younger generation seem to be growing within a society that has more rules than sense in many cases. Politics is important because although it takes certain freedoms, it gives many more in return. Would younger people be more interested in politics if they understood it? Does this mean a better political education in Britain? Should we follow Australia and demand a vote? If younger people, and in many cases the entire population, discovered how important politics is to our state and us individually, would they turn a blind eye? Lawrence Thompson: The key to engaging young people in politics lies in the education system. This means a country-wide approach in which the compulsory class of Personal Development or PSHE is used to educate students of GCSE age on the political system. Simply the basics, would help provide a base for the students to go on to learn more and feel knowledgeable enough to engage in the political world, whether this is voting, campaigning, volunteering etc. It is important as many ignore politics, perceiving it to be complicated and a waste of time, basic knowledge on the voting system, parties and how to participate could help change this. Nathanael Tan: In my opinion I find that improving the engagement with young people both in education as well as on a social scale is key in engaging young people in politics. In my home country in Singapore, we are engaged in the basics of politics at a young age by simple proceedings such as reciting the pledge every morning or having MPs come down to schools to have open discussions with students. When young people are given a voice to speak out to the government, they form a collective identity and will be more willing to engage in politics to further improve their idea of what politics means. Rebekah Kulidzan: To engage young people in politics you must start with education. From a young age there should be a class once a week or activities in tutorials where young people can learn who the Prime Minister is, what his role is, why we vote, and how to vote. Once this is taught, over a period of time more young people will develop an understanding to think for themselves and engage in political activity whether it be signing a petition, participating in protest, or even casting their vote. If we can educate children, a percentage of the young adults they’ll become will have a keen interest in the political system. Tom Sweeney: It can be said that the majority of British adolescents have little to no interest in politics. This is a damning statement considering the impact that politics has on everyday life. Every action is often determined by a political decision, whether it be spending money in shops to going to the hospital for a check-up. Politics is often seen as a difficult and complicated subject, however I feel this is down to the lack of education on the matter. If Politics was to be taught from a younger age, the systems would be easier understood; more people would take interest and decisions on who to vote for would be more informed. Arhant Mathur: In the midst of the last general election my school held a special assembly. Sixth formers posing as leaders of different political parties went on stage to deliver speeches. It was an attempt to generate the political interest of the younger years, and was met with rounds of applause and boos. All in true House of Commons style! I realise now, putting young people in a situation where they are able to interact with politics in a genuinely enjoyable environment is key to generating their interest. Inspired, I asked my mum that evening ‘who are you going to vote for’? Open Access, Open Minds: Who should be the academic gatekeepers? This article was originally published in The Author (Journal of the Society of Authors). The debate on open access for academic research has reached boiling point – it is difficult to open a serious newspaper or have a conversation with anyone connected to a university without it coming up. Less discussed, outside the pioneering fringes of the open innovation agenda, are the likely effects on wider book markets, our cultural and intellectual life, and the very possibility of a writing career. The argument that publicly funded research (or research conducted as part of a university contract) should be freely available to read by anyone who wants it around the globe is a compelling one, especially for academics who have spent years writing their major book, to find that it has sold only 200 copies at a stratospherically high price. Following the publication of the Finch Report in 2012, the government has announced its adoption of a ‘clear policy direction’towards open access for all publicly funded research, with preference given to a model from science publishing in which the publisher charges an Article Processing Charge (APC). This raises two significant areas of concern. The first is the major difference between scientific research, in which it is the dissemination of the research findings that matters, and the creative and imaginative labour of the humanities researcher, in which value is created in the acts of thinking about and writing the book or article. The second is how a model developed for journals might be extended to books which, in the humanities and social sciences, are of equal, if not greater importance. Moves by certain funding bodies (the Wellcome Trust, for example) to mandate full open access on the scientific model (so-called ‘gold’ open access) for all research they have funded, including that published in book form, rest on two dangerous assumptions. The first is that books written by academics are effectively extended journal articles – primarily vehicles to report on the findings of research projects. The second is that the traditional academic publisher is a ‘gatekeeper’: the Heracles of the academic world, restricting access to the Mount Olympus of public recognition. The furious backlash against some scientific journal publishers, accused in the open-access debates of taking publicly funded knowledge and selling it back to academia at vast cost without significant added value, seems to have coloured views of the industry more generally. It led to George Monbiot’s memorable denunciation of academic publishers as ‘knowledge monopoly racketeers’. Both assumptions devalue the creative, imaginative and collaborative labour of authors and publishers. There is no room in this model for the ‘cross-over’ title – those books rooted in academic knowledge but structured and written to appeal to a much broader general audience. It’s debatable whether A Brief History of Time, The Origins of the Second World War or Morality would ever have been published had Stephen Hawking, A.J.P. Taylor or Bernard Williams been reliant on a university or a funding body stumping up an APC of £11,000 (the figure presently charged by a number of leading academic publishers). Even if they had, it is doubtful whether it would have been the same book. Nor is there room for the non-tenured specialist, writing serious scholarly books without the benefit of a university affiliation. I have been an academic publisher for 25 years and have, over that time, shepherded hundreds of books to publication. I’ve published work that has achieved international recognition and work that is important and beautifully written yet has failed to break into the audience it deserves. I find it very hard to think of myself as a gatekeeper. I do not spend my time deciding between hundreds of fully-formed books, ready to be launched to a willing audience. I think of myself more as an enabler – someone who knows the commercial book market, is able to see what’s interesting and potentially saleable about a book, and can help the author to develop it. Some of what I publish comes in the form of a speculative book proposal in which, almost invariably, some revision is required and often radical restructuring. Some comes as the result of collaboration – comments on a conference paper, or a chance conversation on campus. Some is more actively commissioned. OUP’s Very Short Introductions, Fontana Modern Masters and Continuum’s 33⅓ series were publisher-created series. All have had significant impact in academia and in the wider literary marketplace. They have helped to make knowledge public. My concern about the article processing charge recommended by Finch and generally seen as a requirement of ‘gold’ open access, is that it puts creative control into the hands of funding bodies and university administrators, removing it from authors and publishers who are experts in making it appeal to the widest possible audience. My argument is with the implementation of open access, it is not a grouch about open access itself. As an editor, one of the most depressing experiences you can have is seeing an important, original, brilliant book– enhanced by creative work from editorial, design, production and marketing people– launch and sell only a couple of hundred copies to academic libraries. As publishers, what we should be aiming to do is to make things public.The academic book industry was once pretty good at that, and has been less good in the last ten years. So, along with a number of publishing colleagues, I welcomed and have watched closely the genesis of the open-access movement and the debates on Creative Commons (CC) licensing. And for the past four years I have experimented with a new ‘open’ model of publishing for Bloomsbury. More than 80 scholarly booksare now available for online accessvia the publisher’s website, under CC licences.The books appear in html format – we have taken trouble to ensure that they are readable and attractive, but they are not designed for printing or downloading to an ebook reader. Our aim is for readers to be able to browse, reference our authors’ work and cite it in their own – but we also hope that they will decide to buy a print edition or a fully functional version of the ebook. We also aim to enable students and scholars from the developing world and general readers with no access to a library collection to read and engage with the work online.There is no embargo period, and no APC is required – this is a publisher-funded and publisher-designed initiative to establish whether it is possible to ‘open’ a book to a wider public while simultaneously publishing on a traditional, commercial model. In academic debates, the assumption is often made that the existence of a free online text will radically diminish print sales and destroy digital sales (thus the need to compensate publishers for lost revenues with an APC). This view has been challenged by open-access advocates – Cory Doctorow argues that as a novelist his problem is not piracy, it is obscurity. But my experience at Bloomsbury is that average commercial sales of ‘open’ titles are about 10% ahead of comparable ‘non-open’ titles. Titles with ‘cross-over’ potential to a wider audience seem to have prospered on the programme – those titles which have been very widely accessed online (10,000 hits or more) have generally also been our commercial bestsellers, and a handful of titles on the programme, notably those in which the author’s social media presence is strong, have sold radically better than expected. I do not claim an unqualified success. Edited books, especially those covering particularly topical debates, seem to have suffered. And I make no claim that ours is a definitive solution to the challenges of open access. But it harnesses the exciting possibilities of digital dissemination and CC licensing to enhance what is good about the publishing industry and enable authors to find new markets. There are plenty of other models being trialled: the Open Access Directory lists experiments in collaborative underwriting, cross subsidising, crowd-funding and temporary open access, among others. My plea is for creative thinkers in the book industry – publishers, authors, booksellers, agents, librarians – to be clear about what we can gain from open access. There are myriad possibilities not touched on here: the resurrection of long out-of-print books, exposure to a wider range of writers from the global south, experimental projects in new genres by established authors, and so on. And just as importantly we need to be clear about what we stand to lose if access to book markets becomes part of a political agenda and public exposure a matter of who can afford to pay. Writers and scholars (and, yes, sometimes publishers too) havebeen the drivers of our extraordinary literary and intellectual culture. We must not allow control of this vital heritage to pass unchallenged into the hands of bureaucrats. Caroline Wintersgill is Senior Commissioning Editor at Bloomsbury. She was one of a small team who launched Bloomsbury’s Open Content programme in 2009. She has an MSc in Politics from Birkbeck College London and an MA in Contemporary Literature from the University of Winchester. This article is written in a personal capacity. 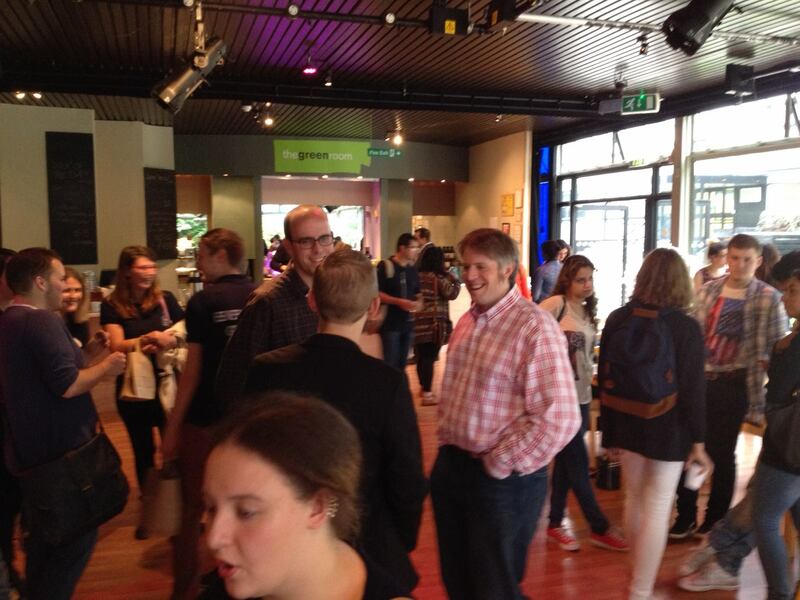 This afternoon, we held our Welcome Reception for our new Masters and Undergraduate students. This took place in the entirely pleasant surroundings of our Nuffield Theatre Bar, and staff and students met over tea and cakes and got to know one another a little better. It’s always really lovely to meet new students in relaxed surroundings, away from hectic induction schedules, and the afternoon provided a great opportunity for staff to begin to put faces to the new names, and for students to find out more about the teaching staff they’ll be working with for the duration of their programmes. I was hugely impressed to talk to undergraduate students with so much to say about politics, and found that several people already had real passions and interests that they hope will form the basis of their future dissertations. Similarly, our Masters students had big plans for their short year with us, and lots of ideas about the careers they hope wait for them on the other side of their studies. Like my PAIR colleagues, I had a lovely afternoon, and can’t wait to start meeting our new students in the classroom and hearing more from them.